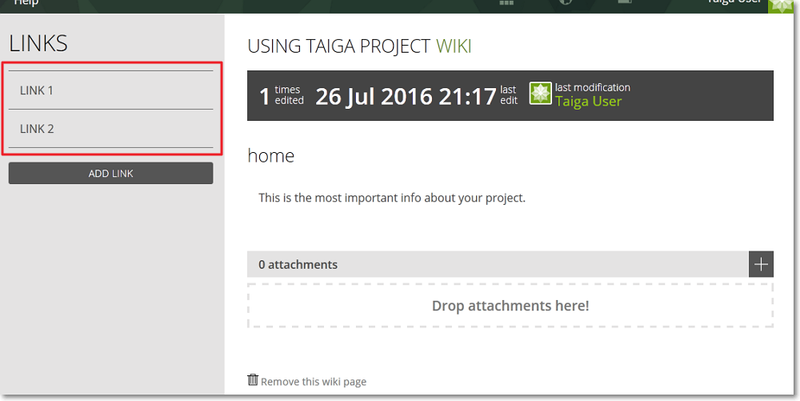 You can use the WIKI module to add relevant information about your Taiga project as “link” which you can then share with your team. To access the WIKI module, on the Taiga panel, click . Note: If you do not see the WIKI module icon on the Taiga panel, you may need to enable it. To see how to enable/disable module, you can go to Modules. After you create other WIKI pages, to navigate to those pages, you can click the name of those pages on the LINKS list; you can see the WIKI home page every time you click on the Taiga panel. Note: To completely remove a WIKI page, position your pointer over the name of that page on the LINKS list and then, on the right side, click . Note: When you click Remove this wiki page on the WIKI home page, you only delete the info contained on that page. The next time you access the WIKI module, you will see an empty home page where you can add info you want to share.